Having already made one movie about buildings being destroyed with little regard to any people who may be inside them, San Andreas director Brad Peyton is reuniting with Dwayne Johnson for Rampage, his ’80s arcade game adaptation. 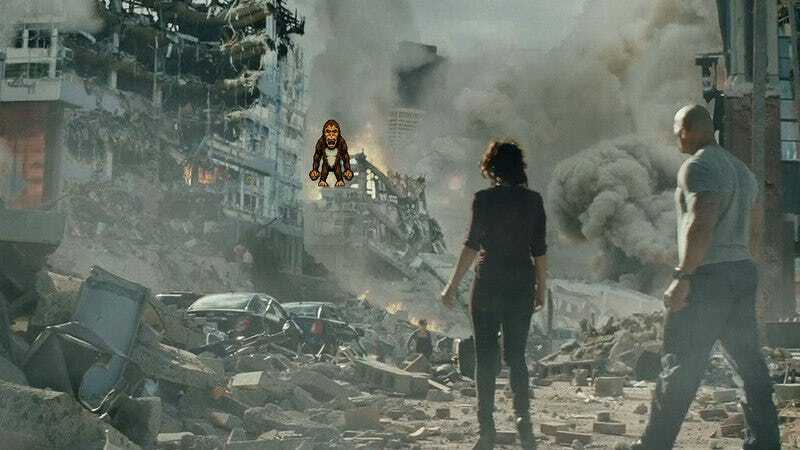 We still don’t know much about the plot other than that it will involve three giant monsters (an ape, a lizard, and a werewolf) wrecking a city and the one man (Johnson, obviously) who stands in their way, which is about as close to the plot of the video game as anyone needs to get. If Rampage is anything like San Andreas, though, Johnson’s character will be someone whose job is literally to save people from giant monsters, but as soon as the monsters attack he’ll run away and try to patch things up with his ex-wife. Also, the only people who will be explicitly shown dying will be people who did bad things earlier in the movie, but also thousands and thousands of people will die in the background without anyone mourning them. But, again, that’s only if Rampage is anything like San Andreas, which it might not be. Johnson and Peyton also worked together on Journey 2: The Mysterious Island, but that movie was for kids, so we don’t think very many people died in it. Rampage won’t be in theaters until 2017.